Campbell, T. Colin. The China study : the most comprehensive study of nutrition ever conducted and the startling implications for diet, weight loss and long-term health. BenBella Books, 2005. Fulkerson, Lee (writer/director). Forks over knives. Monica Beach Media & Virgil Films. 2011. At least once every month, I learn about a Fuqua faculty or staff member who has been diagnosed with cancer. Many others are survivors – thanks to Duke Univ. Medical Center. And any student who lives long enough runs the risk of this disease, which some people are calling an epidemic. 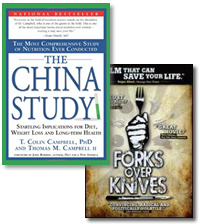 Staff member and cancer survivor Mia Ketchum recommended two resources for the Ford Library’s health management collection – the video Forks over Knives and the book, The China Study* by Dr. Colin and Thomas Campbell. The book and the video cover the same topic — the connection between diet and chronic diseases, such as heart disease, diabetes, and cancer. They also review the work of scientists and conclude that a whole foods, plant based diet can prevent these diseases. Furthermore, they provide evidence that this diet can repair damage to cells, reversing the course of disease and restoring one to full health. In discussing the link between food and health, these scientists recommend that patients eat fruits, vegetables and whole grains, avoiding animal based foods including meat, fish, milk, cheese and eggs. The ideal diet is a vegan diet, composed of whole unprocessed foods, based on plants. The authors are convinced that scientific evidence about diet has been tainted by financial support for scientific research in nutrition made by the dairy and meat industries. As a cross check, this reviewer contacted the nutritionist at Duke Radiation Oncology and discovered that Duke is also recommending that their patients eat more plants and fewer animal based foods, although they stop short of recommending a vegan regimen. Not everyone will be motivated to adopt a vegan regimen, yet those interested in maintaining a healthy diet would find this book or video illuminating. * The China Study is also available as an audiobook. I love to hear a student ask about a city’s cost of living because it means they’ve begun salary negotiations. This morning, at 10:43, I noticed the beginning of that happiest of times – job offer season. A student asked for a reliable source for local level cost of living data because he couldn’t trust what he’d found on the web. Sometimes those words are like angels singing to my ears. It means there are still a few things I have tucked away in the reference collection that can really help someone with a major decision. In this case, it’s the ACCRA Cost of Living Index. Not a stunning title, but this quarterly publication issued by the Council for Community and Economic Research, provides cost of living and comparative price data for 390 US urban areas. In addition, it also offers an equation that allows users to compare the cost of living in one city to another. So when that offer comes through, look for the latest AACRA Cost of Living Index. Better yet, stop by the reference desk and I’ll show it to you. Happy Job Offer Season! Ronson, Jon. The psychopath test : a journey through the madness industry. Riverhead Books, 2011. Students, the next time you are in class, look around. Chances are good that at least one person in the room is a psychopath. And when you graduate and move on to your dream job, chances are even better that several people in the executive suite are too. How to do you spot a psychopath? According to Jon Ronson (The Men Who Stare at Goats), psychopaths are smart, charming and impulsive. They are ambitious and enjoy power. They are easily bored. They have an inflated sense of self-worth and blame others for their mistakes. 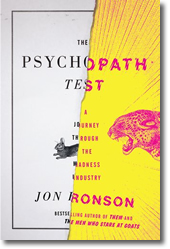 Ronson identifies 20 such attributes in his new book, The Psychopath Test, and he interviews doctors, researchers and criminals about the impact that psychopaths have on people and society. Many psychopaths operate outside of asylums and penitentiaries. Corporate and political leaders often score high on the psychopath test, where their love of power is useful and their lack of empathy is a benefit. These leaders ruin companies, families and the economy. Many live in New York, L.A. and London, drawn to the excitement of those cities. In relating his conversations with psychopaths, Ronson pairs an amusing tone with nightmarish details. He bases his book on the well-regarded Hare PCL-R Checklist, developed by Bob Hare, co-author of Snakes in Suits, a book about psychopaths at work. He also discusses the work of Martha Stout in The Sociopath Next Door. All of these books are excellent reads, available in the Ford Library’s collection. From November 5 – 6, 2011, a number of library e-resource providers will be conducting system maintenance. Their services and sites may be unavailable, or only intermittently available, during the times below. Products Affected: Intermittent availability of e-journals via the Wiley Online Library web site. Products Affected: Intermittent availability of the Frost.com web site.